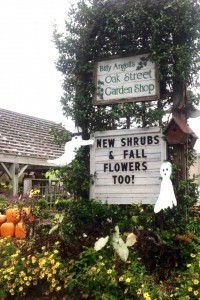 There are many businesses in the surrounding areas that have celebrated more years than our 25, but in 2015 I felt the need to mark the passing of time and the evolution of this small independent gardenshop in the Mountain Brook suburb of Birmingham, Alabama. With the 2013 overhaul of our website by Rebecca Moody, this process has become as easy as writing a blog post, and events that might otherwise be forgotten or dismissed as unimportant can be recognized and remembered. And, whether these words are read or not, it feels good to know they’re here and won’t be allowed to fade with faulty memory. 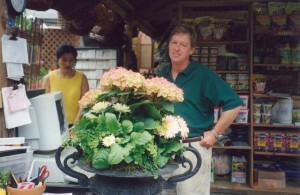 From Oak Street Garden Shop’s beginnings in 1990, with his construction of the first shade house and greenhouse, to the process of buying the lumber and saws necessary to put together the tables and erect the fences that would surround his nursery, it was obvious owner Billy Angell enjoyed woodworking and building. He knew that his flat-topped and quite ordinary shade house, covered with its simple shade cloth, wouldn’t do forever. Wanting something more permanent and visually striking (and knowing this would be a big woodworking project), he was excited to get started and began to make his drawings for submission to Mountain Brook City Hall for design approval and a building permit. 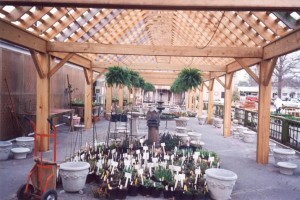 With the city’s consent granted in the mid 90’s, Billy and employee Jon Culver began working on the new shade house after the busy holiday season had passed. At this time of the year the nursery was relatively empty, so moving in the quantities of lumber needed was also easier, though the weather didn’t always cooperate. In fact, you can see the snow in one of these pictures (Thankfully this wasn’t the year of the blizzard!). 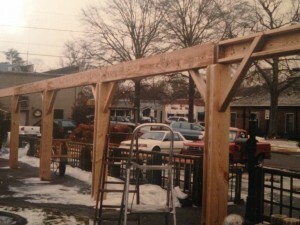 With additional help provided by Eddy Robinson (a friend and fellow carpenter), the new shade house slowly took shape, and its 25′ high A-frame, after completion, would become a prominent feature of his garden shop. It was a very exciting event! 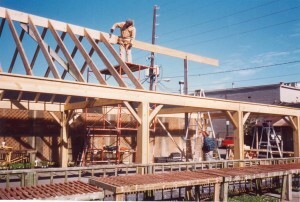 While Billy, Jon, and Eddy worked each day raising the shadehouse, the shop hummed steadily along. Ellen had begun putting combinations of green and flowering plants in baskets the first year of business to give as gifts, and by now there were many people using these baskets to provide fresh plants in their homes too. As a result we stayed very busy at the two work tables, situated at the time on either side of the entrance to the greenhouse. Most days of the week we worked evenings after closing to fill orders to be picked up the next day. Because these tables were in plain sight on each side of the front doors, we tried to keep them as neat as possible. The original plan had been to keep one clean for wrapping potted plants as gifts, while the other work space would be allowed to get “dirty”, the result of making basket combinations, planting, etc. That arrangement didn’t last long though, since we were creating more plantings than wrapping flowers, and potting soil and plants inevitably ended up all over both tables. This would eventually become quite a problem as more employees came and the design business grew. Where to put the finished baskets and container plantings would also need to be addressed soon, as there were more and more orders to find room for. Confederate Jasmine had reached the top of the sign…it was killed the winter of 2013. 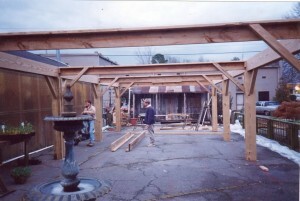 It was during the construction of the shadehouse that the distinctive Oak Street Garden Shop sign planter went up. It has, over these many years, become one of my favorite planting spaces, giving me opportunity to showcase those plants that will handle the brutal Alabama summer heat radiating off the asphalt in July and August (And has offered lessons on those that can’t too!). I’ve also been able to combine many cool season plants in the winter months, have grown vines of Confederate jasmine, Mandevilla, Carolina Jasmine, and Moonvine up its length, and will try Wisteria frutescens ‘Amethyst Falls’ , a beautiful selection of our non-invasive Native American wisteria, in this, our 25th year. I’m so glad it’s a planter sign. It seems fitting for a garden shop. 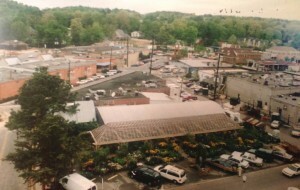 The aerial picture shown here was taken sometime in the fall of 1997 and shows off the shade house, which still looks new. It was in the spring of this year that a shy 20 year old named Jamie applied for a job. Like me, she’d gotten lost trying to find her way and tells of finally following a white unmarked delivery van that unbelievably led her to the shop. How happy we are she chose that particular white van to follow! It’s been a joy to see how she’s grown as a mother, an artist, and now as manager of the greenhouse. So the final physical framework of the building was completed, and there was a tightknit framework of employees as well.. Soon, though, this would change. 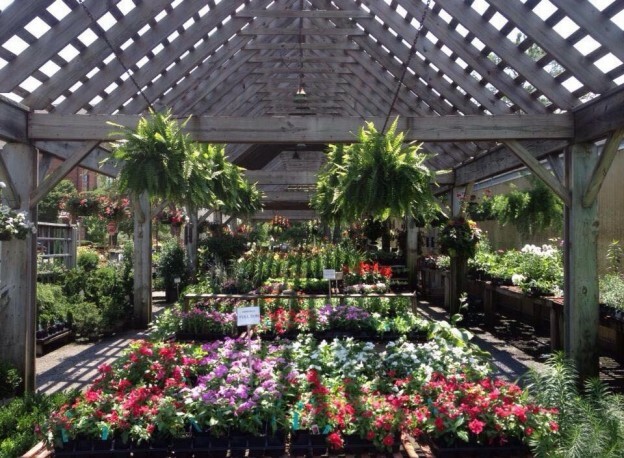 By the turn of the new century, and the end of Oak Street Garden Shop’s first decade in business, Ellen has been wooed away to begin a writing career for Southern Living Magazine and Jon ventures out to open his own garden shop. In the next posts, a friend makes the perfect suggestion for changing the work table layout, we lived through the first construction across the street as the Emmit O’Neal library is razed and rebuilt, and a devastating drought threatens to end the business. 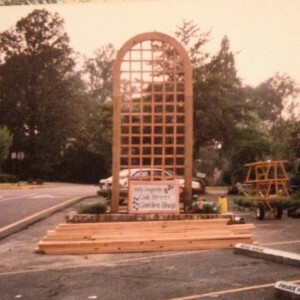 This entry was posted in Anniversary, History and tagged building the shade house, emmit o'neal library construction, mountain brook garden shop history, the history of oak street garden shop on March 7, 2015 by Kris Blevons.